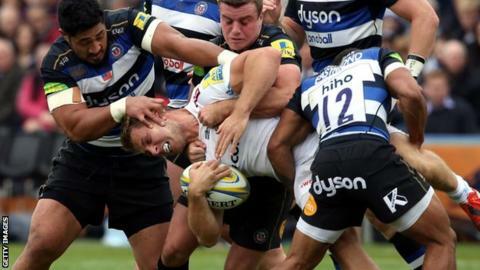 Bath Rugby have confirmed the club did not exceed the domestic game's £4.76m salary cap last season. Premiership Rugby has said "confidential agreements" were reached following "certain issues" with some clubs over last season's limit. Ten clubs have now denied their involvement and none have been found guilty of "breaching" the salary cap. The salary cap for this term is £5.5m, rising to £6.5m in 2016-17 and £7m the season afterwards. Northampton, Gloucester, London Irish, Exeter, Wasps, Harlequins, Newcastle, Sale and Worcester have all previously stated they were not among the clubs involved. Only Saracens, Leicester and last season's relegated club London Welsh have yet to comment on the issue. Bath say their spending was £4.71m during the 2014-15 season. The club confirmed they are committed to spending up to the cap to provide "the best squad possible", but stressed they have one of the smallest squads in the competition. Coach Mike Ford had 36 players last season, which included 14 internationals. And while insisting they stayed within the cap, and will do so again this season, Bath said in a statement that English clubs had been "significantly disadvantaged" by it, both domestically and in European competitions. "The clubs representing England in Europe have been expected to compete with European clubs, who have a spend of up to 100% more on their squads," the statement continued. "These same English clubs also lose international players for one third of the domestic season with no cap relief. "This system was inherently unfair, open to challenge and was in need of fundamental change." Bath believe the new salary cap settlement agreed last week is "a much fairer system for all clubs" and will allow them to better compete "on a fairer playing field" and help produce new, young talent.